Earn up to 3,992 reward points. Great for capturing vocals and speech. The handheld Audix VX10 Condenser Microphone is designed to raise performance standards in the areas of live sound and broadcast. With a uniformly controlled frequency response from 40Hz-20kHz, the AudixVX10 is highly sensitive to transient response and reproduces vocals and speech with exceptional detail and realism. The Audix VX10 mix has a cardioid polar pattern, which helps to isolate the vocals from the rest of the instruments on stage. Other features include a 21mm gold vapor capsule and a multi-stage internal pop filter. The VX10 microphone handles sound pressure levels of ‰138 dB and provides over 20 dB of ambient noise rejection on live stages. For greater control with loud stage volumes or extremely powerful vocalists, the Audix VX10 microphone is also available in a low output model (VX10-Lo). In addition to vocal applications, the Audix VX10 is ideally suited to capture acoustic instruments such as guitar, woodwinds, brass, percussion toys, drum overheads, hi-hat, and piano. 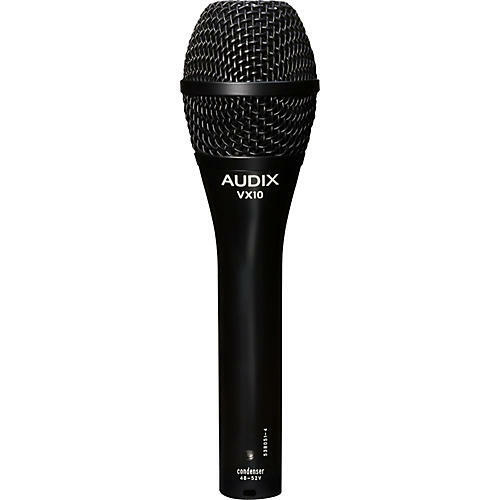 The Audix VX10 is also an excellent microphone for professional studio recording. The durable Audix VX10 microphone is well-balanced, comfortable to hold, and made with high standards and tight tolerances. The Audix VX10 condenser mic's roadworthy construction includes a precision die-cast zinc alloy body, black e-coat finish, laser etched model and serial number, Switchcraft XLR connector, and heavy-duty nylon clip. Step up to the professional quality VX10—order now.